Much to the chagrin of the desperate Jet fan base, it appears Todd Bowles will be back for a third season. Had Todd Bowles not gone 10-6 his first season, however, would the fans still be looking to run him out of town on a rail after his second season as head coach? Fact is that the 2015 Jets team NEVER should have been 10-6, and this season is much more reflective of what 2015 should have been. Firing Todd Bowles may feel good but a close look at the facts will show this is a mistake. So what are the differences between last year and this year? Why were the Jets able to win 10 last year and only half that this season? The answers really aren’t difficult to find. Instead of getting caught up in emotion, just look at these obvious differences and it will become clear quickly. The easiest place to start is with the quarterback play. Ryan Fitzpatrick, a career journeyman with a knack for turning the ball over like it’s going out of style, caught lightning in a bottle in a contract year last season. Once Geno Smith went down, Fitzpatrick knew the team was his. Remember, last season’s Jets had very low expectations. Fitzpatrick kept his turnovers down (sans the most important game of the year, of course) and the team won 10 games. This year, he went back to his true colors, and the Jets struggled. 2015 Ryan Fitzpatrick: 31 Touchdowns/15 Interceptions/2 Fumbles; 2016 Ryan Fitzpatrick: 12 Touchdowns/22 Interceptions/6 Fumbles. While it appeared coming into this season that the Jets would have a more difficult schedule than 2015, after everything was said and done both years’ schedules were very comparable record-wise. One thing that killed the Jets this season, however, was a four game stretch early in the season where the Jets went from 1-1 to 1-5, essentially ending their season before it started. This four game losing streak came at the hands of Kansas City, Seattle, Pittsburgh, and Arizona. The total record of these teams this season was 40-22-2, and the first three (Chiefs, Seahawks, and Steelers) were all division champions. Through the first five games last season, the Jets got off to a 4-1 start. Those games were against Cleveland, Indianapolis, Philadelphia, Miami, and Washington. The combined record of those teams last year was 33-47 with only one team making the playoffs, that being the Redskins who won a weak NFC East.at 9-7. 2015 Jets start: 4-1; 2016 Jets start: 1-5. The changes in offensive personnel between last season and this are also a major factor. D’Brickisaw Ferguson, a Pro Bowl left tackle that started every game in his career retired prior to the 2016 season. Two-time All Pro center Nick Mangold missed eight games this season for an offensive line that had a litany of problems. In 2015, Eric Decker had 80 receptions for 1,027 yards and 12 touchdowns. This season he only played in three games. Chris Ivory was the top rusher for the Jets last season going over 1,000 yards on 4.3 yards per carry. After Ivory left for Jacksonville, Matt Forte was brought in. Forte (who just turned 31), went just over 800 yards on 3.7 yards per carry this year. I try to preach looking at the facts of a situation and not get caught up in emotion and this is a crystal clear example of that. Yes, the Jets did have some embarrassing loses this year, some in prime time. Nonetheless, as I have demonstrated, there are a number of factors out of Todd Bowles’ control that have contributed to a bad, but not horrific season. 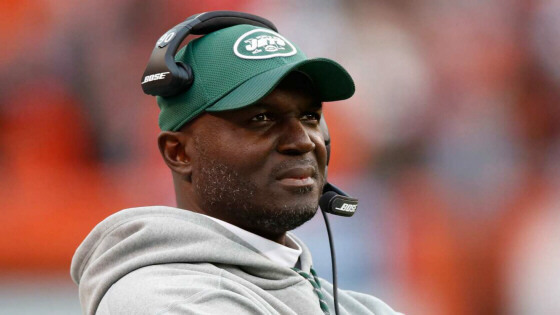 Patience is not a luxury Jet fans afford their coaches, and I realize that, as difficult as it is to hear, Todd Bowles should probably stay even if next year’s team only marginally improves. Teams like Cleveland, Buffalo, Jacksonville, and until very recently, Oakland have had a revolving door of coaches over recent years and are going nowhere. Jet fans have to forget about 2015 and act as if 2016 were Bowles first year.